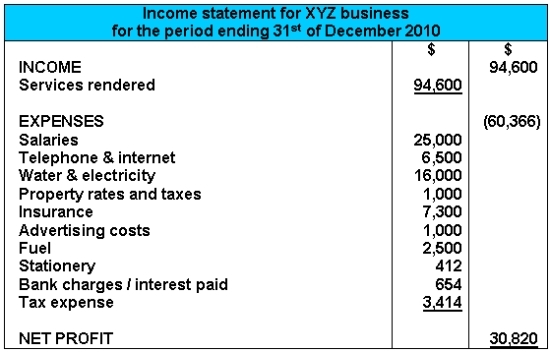 Q: What is the difference between the income statement and the profit and loss account? A: The income statement is a statement (a report) which forms part of all the financial reports, called the financial statements . The profit and loss account ("account" not "statement") is one of the T-accounts . But this profit and loss T-account is a special kind of T-account with a special role. You see, the profit and loss account is really only opened at the end of the year. The rest of the year it has a zero balance (in other words, it virtually does not exist). It is used right at the end of the year to calculate the profit or loss for the year. 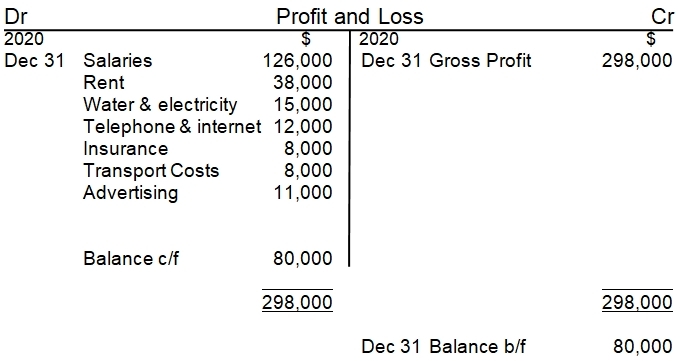 The balance of the profit and loss account at the end of the year represents the net profit or loss for that year - which is the same figure we show as the net profit or loss in the income statement (in the profit and loss account above, this comes to $80,000). At the end of each year this balance is then transferred to owners equity, as profits or losses belong to the owner. The specific name of the owner's equity account this goes to is retained earnings (also known as "accumulated profits"). For a business that sells products, the net profit or loss in the profit and loss T-account (the balance of the account) is calculated by transferring the gross profit from another account called the trading account and then transferring all other business expenses into this profit or loss account too (expenses such as salaries and wages, insurance, rent, etc.). This then gives a balance which represents the net profit or loss for the year. The profit and loss statement ("statement" not "account") is the same as the income statement - it's another term for the same report (click the link here for an example and full lesson on the income statement / profit and loss statement). Hope that makes sense and that you now understand the difference between these accounting terms! Thank you so much, sir for giving the most informative answers to our questions. The Income Statement shows the profit/loss for any date/day of the year while a Profit & Loss Statement reports profit/loss for the whole accounting period. This is a very informative article. Properly analyzing your profit and loss statement is vital to business growth. Profit and loss a/c is an account which have debit and credits but income statement is a statement which does not have any debit and credits. Well if you ask me a lot of people did have a lot of confusion regarding both these and I am sure from what I have read from here most people who have understood the difference by now like me too. I think income statement is the form that is used for non profitable organizations like charities and organizations where the income is not coming from sales or revenue or any commercial or trading activity. While profit and loss is used for trading economical organizations where profit is the target. very good definitaion but must include the picture of both accounts, if picture cant shown in this site then minimum heads of accounts should entered.